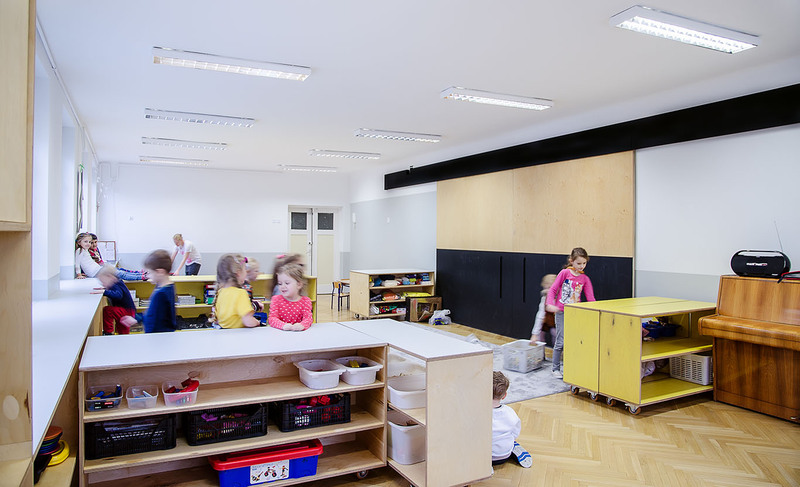 The design was an integral part of a project dedicated to the promotion of kids' active learning in a nursery environment - in which the kindergarten participated. 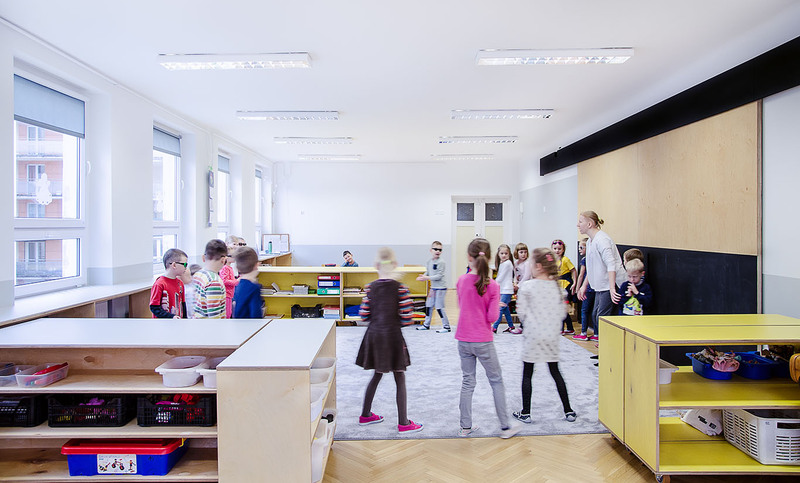 The project's objective was to draft a space for learning and playing that would facilitate changes in the way teachers work with children in accordance with the idea of active learning. On the building’s first floor there are two adjacent classes, both spacious and rectangular in shape. Between them there used to be a pair of double-winged – and usually closed - doors. After consultations with teachers of the neighbouring groups we decided to open up the space and enable the free flow of children and their activities between the rooms. The massive upholstered doors were replaced by sliding wooden panels covered half height in blackboard paint. We used the difference in light exposure in each of the rooms – oriented North and South - as a design inspiration. 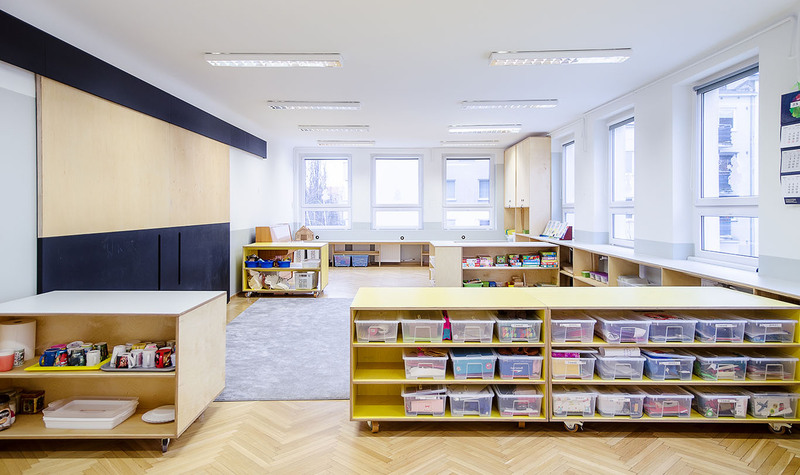 The northern room, with windows lining up the two corner walls, provides now space for artistic activities – a place for creative albeit rather quiet work of the little hands. A broad window sill was installed under the windows overlooking the entrance to the building. It’s primary function was to serve as working table for kids, but it was soon reclaimed as a convenient vantage point to observe the life outside, hitherto beyond the kids’ reach. 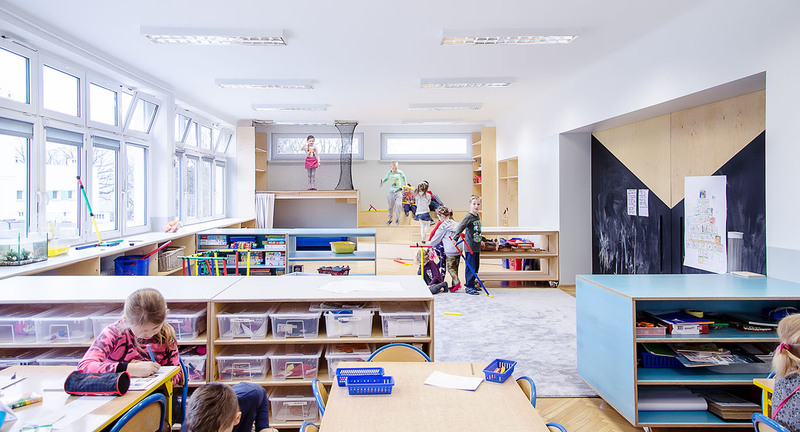 The defining feature of the southern room – exposed to a beautiful warm light coming through the large windows overlooking the wooded playground – is a net-secured mezzanine located in the far corner. It enables both watching the room from above, and finding a hiding spot on the floor below. The stairs to the mezzanine serve as an auditorium. 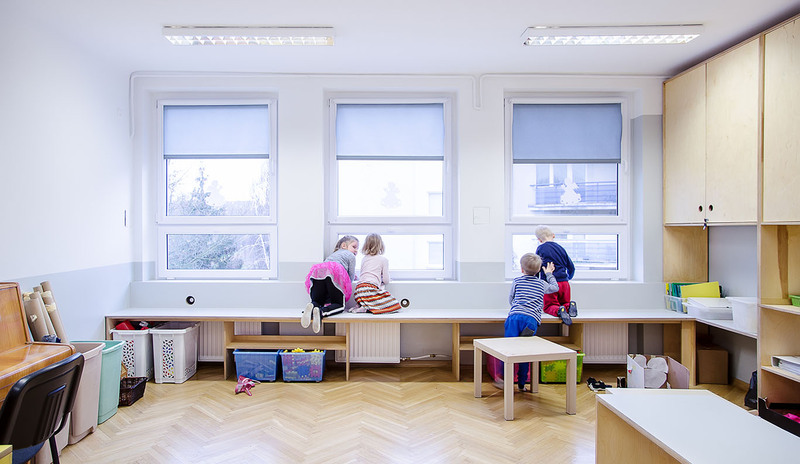 Just like in the other room, there is a broad wooden window sill lengthwise the windows, where kids can build with blocks or just sit and watch the world outside. Each of the rooms is now divided into zones: starting from the entrance there is the table zone, where children have meals. 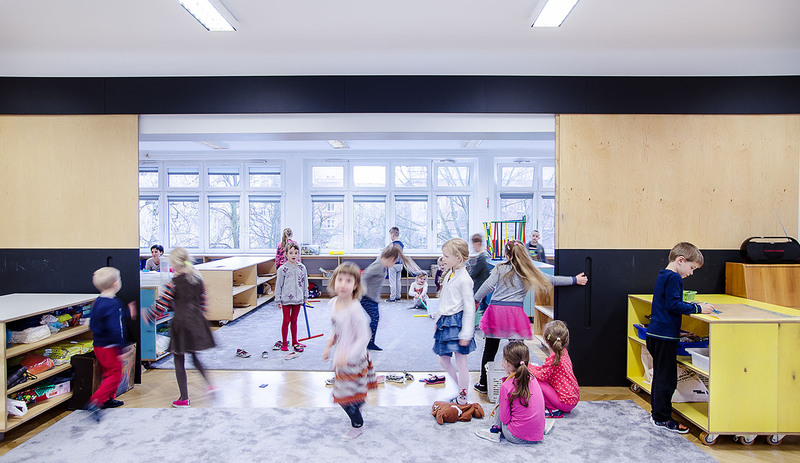 Moving towards the centre of the room we enter the play zone that – due to the sliding door and open access to the adjacent room – covers quite a spacious area to let kids do what they are best at. 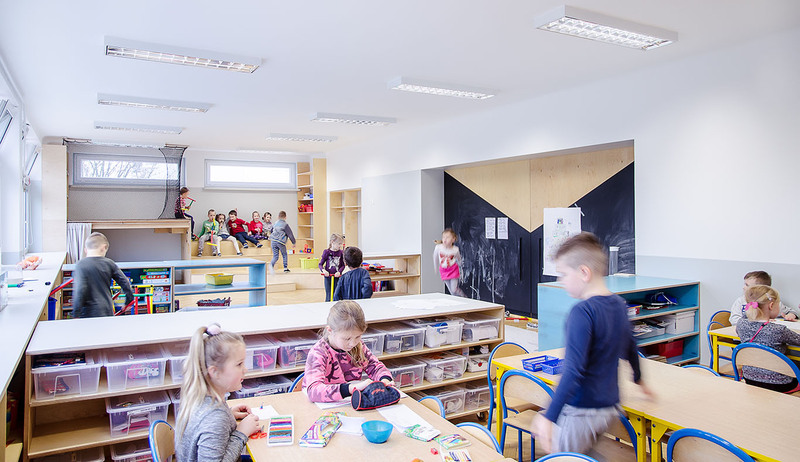 The third zone – dedicated to artistic activity in the northern room and physical activity in the southern one - invites children to socialise, integrate and explore. The zones' perimeters are established with low mobile cupboards that carry all the necessities for work and play. 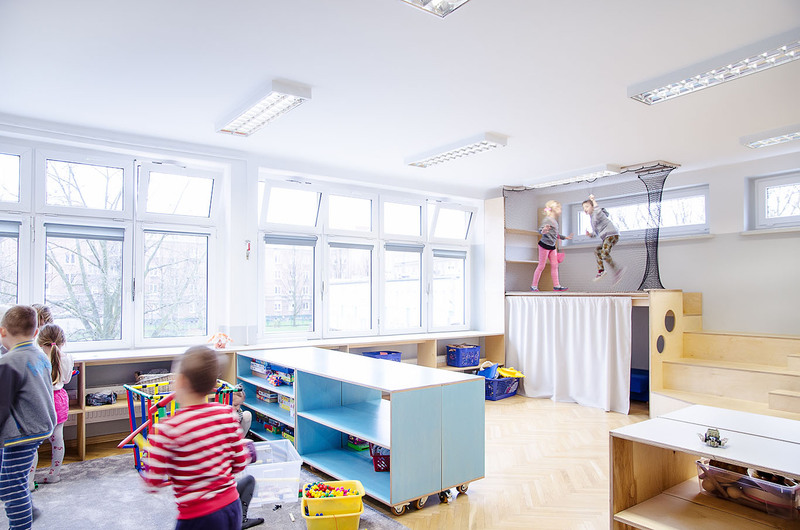 By moving them around the room, the space for different activities can be either expanded or shrunk – depending on what is needed and imagined at the time. The original oak wood floors in both rooms have been sanded and oiled.